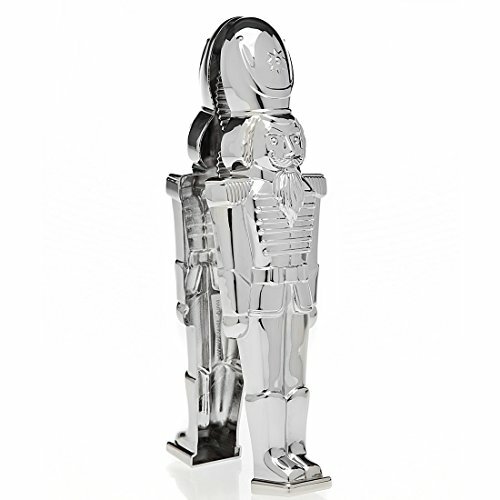 Godinger New And Exclusive Traditional Soldier Stainless Steel Christmas Nutcracker, Festive Holiday Décor- The only nutcracker figure that cracks nuts-Perfect gift item, comes in a beautiful gift box by Godinger at KXSH 365. Hurry! Limited time offer. Offer valid only while supplies last. MATCH ANY CHRISTMAS DECOR THEME: This decorative nutcracker is the perfect way to add festive holiday cheer to your home. This nutcracker will complement any Christmas decor theme and is sure to bring the Christmas spirit into your home. CRACKS NUTS: What's the point of buying a nutcracker that doesn't actually crack nuts? Godinger Silver Art designers saw the demand for a nutcracker that really cracks nuts. So, that's exactly what you see here. A nutcracker with a beautiful look, but it's not just for display....you can seriously crack nuts. It's the only nutcracker figure that cracks nuts. Enjoy your nut party!!! ADD THAT MAGICAL TOUCH TO YOUR HOME: This will brighten up the look of any room and makes a perfect addition to any home's decor. Create Christmas cheer in your home with beautifully designed decor you'll want to put up year after year. Sophisticated and timeless design!